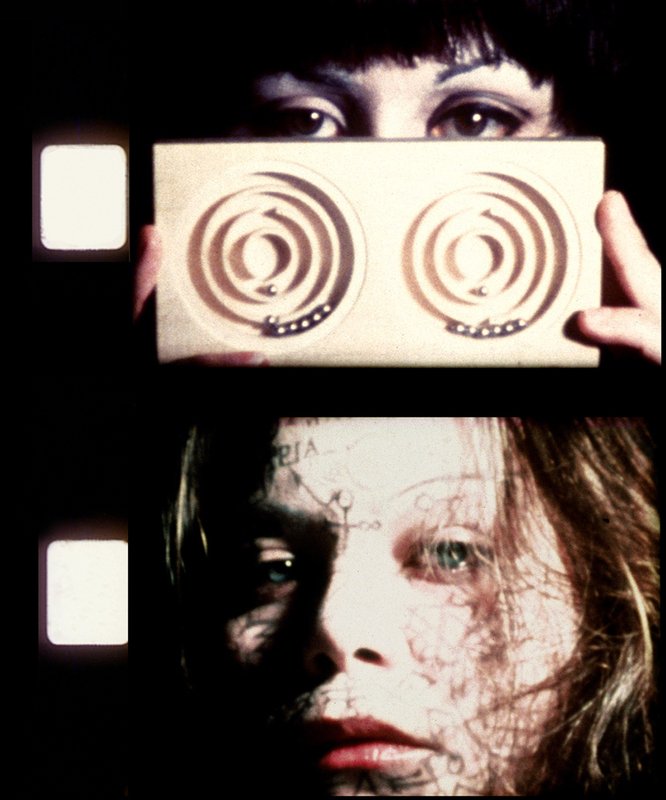 Film Double Labyrinthe (1975-76). Courtesy the artist. Klonaris/Thomadaki, Double Labyrinthe (1975-76). Stills from the film. Photo © Klonaris/Thomadaki. Courtesy the artists. Maria Klonaris (1950, Cairo – 2014, Paris) and Katerina Thomadaki (1949, Athens) are filmmakers, performers, installation artists and theorists based in Paris since 1975. They cosign an interdisciplinary œuvre composed of more than a hundred works structured in cycles as well as a large body of publications. During four decades the two artists’ work has been showcased internationally in major institutions with retrospectives at the Pompidou Center, the Cinémathèque française and recently at the Jeu de Paume. The French Film Archives/CNC restore and preserve their films, the Bibliothèque Nationale de France collects and preserves their texts and audiovisual documents within the Klonaris/Thomadaki Archive, and the Institut National de l’Audiovisuel holds their radio creations. Maria Klonaris and Katerina Thomadaki develop a transcultural reflexion on body, memory, ritual, dream, mythological figures as archetypes (Astarti, Electra, Persephone, the Hermaphrodite, the Angel), gender and identity as the sites of destabilized assumptions. Parallely they are concerned with crossing technologies and media and spatialising images and sounds within immersive projection environments and monumental site specific installations. Since 1976 they have been working on body as language. The VENICE INTERNATIONAL PERFORMANCE ART WEEK 2016 presents Double Labyrinthe (1975-76, Super-8mm, 50min., silent). With this film-manifesto, the two artists invent what they called the Cinéma corporel (Cinema of the Body), they present themselves as a "double auteur femme" and they lay the foundations of the radical critical and esthetical positions of their work to come. Double Labyrinthe has a mirror structure based on their "mutual gaze": in the first part Katerina performs while filmed by Maria and in the second part Maria performs filmed by Katerina. The film is conceived, directed, performed, filmed, edited and produced by Klonaris/Thomadaki.